Andy Mullins loves pubs, but not in the way you or I might. He absolutely lives and breathes them. 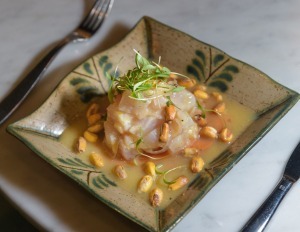 "Do you know that book McCarthy's Bar," he asks me over lunch at Pastuso, the Peruvian restaurant tucked down Duckboard Place, one of the little alleys off the top end of Flinders Lane. "My dad gave me a copy, and [reading it] I realised what a pub used to be – a place you celebrated births, deaths, love, loss, triumphs." A place, in other words, that's right at the heart of what we used to call community. It might be overreaching to say that's what Mullins and his partners in the Sand Hill Road group are trying to build with their string of eight (and counting) pubs, since their primary aim is to run a profitable business. But it wouldn't be entirely wrong, either. Visit the company's website and you'll be met by a bunch of words in huge type. Laugh. Learn. Live. Love (in the form of a heart emoji). Life. There's a page dedicated to Karma Kegs, too, a scheme wherein they donate the proceeds from a couple of hours worth of beer sales each week to charities, mostly focused on the Indigenous community in Port Augusta, South Australia. "Between 5pm and 7pm every Friday, we'll donate the beer, and you come in and pay what you think it's worth," he says. "You could in theory pay 10 cents for a pot, but we always take more [on the night] than the standard price, because people care." Not everyone, mind. "We had a young tradie come in and buy six pints for $3. The staff said that's not what it's really about, but they couldn't force him to do any different. Anyway, he had his one beer, walked outside and he had a parking ticket on his car. So he ended up paying $72 for those pints." Sand Hill Road started in May 2000 when Mullins and his brother Matt and two mates, Doug Maskiell and Tom Birch, quit their day jobs in finance and marketing, pooled their money and took over the lease of the Commercial Club Hotel in Fitzroy. "The whole thing was Doug's dream, and he made the mistake of telling the rest of us," Andy says. "We kind of hijacked it." They lived on site with 17 mates while they renovated. "We built it ourselves, did our own plumbing and electrical, electrocuted ourselves in the process," he says gleefully. "I struck my chisel into a wire. It sent me back about three metres." They had no money, and no chance of securing a loan, so they convinced 28 mates to chip in anywhere between $1000 and $6000 a piece to fund the venture. "That first time was amazing. We were doing things 16 years ago that would now be called hipster. We had no beer signage in the place, no TVs, no parmas, no billiard tables. We had a budget of about $30,000, and we spent about six grand of it on the women's toilets to make them nice." Smart move. "It was an instinctive move. When we bought that pub it still had a Ladies Lounge. That showed us how much pub culture had to change, if we were going to attract a new market, particularly a female market. We had to take the music seriously, we had to take the design seriously. That really set the blueprint for how we approach hospitality." By the time Mullins and I sat down to lunch, the four partners had bought 10 pubs, on-selling three of them. 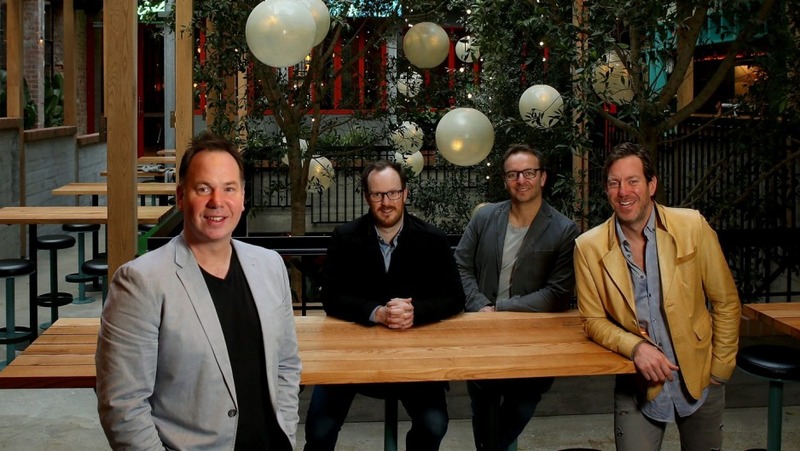 Their portfolio included the Terminus Hotel in Abbotsford, the Bridge Hotel, the Richmond Club Hotel, the Posty and Holliova in Richmond, the Prahran Hotel. They've since added the Waterside Hotel on the corner of Flinders and King streets to the stable. 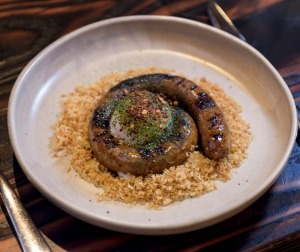 The jewel in the crown, though, is Garden State Hotel in Flinders Lane, just around the corner from where we're devouring a delicious plate of Peruvian pork sausage, coiled like a snake around a poached egg atop onion puree and panko crumb. "You break the egg and onion to make a sauce," the waitress helpfully instructs. Their pubs are stylish affairs, with great design and smart food breathing new life into old buildings. But Garden State is something else, a $12 million rebuild of what was once Rosatis (and, long before that, an auto mechanics). Mullins says they'd eyed the site for about five years before they got their chance, and when they did it took just 24 hours to complete the deal with the Zagame family, who had toyed with building an 11-storey tower on it. "We went all in on this one," he says. "It was a sit-down with our wives, individually and collectively. Savings that could have gone into our lives have gone into this. It's a 40-year lease, which protects our families, because it means if it doesn't work we've got time to fix it. But if it doesn't pay itself back we're selling the houses and moving back to the country." The Mullins boys grew up in Gippsland, near Morwell. Their father was a lawyer who went into the restaurant business. 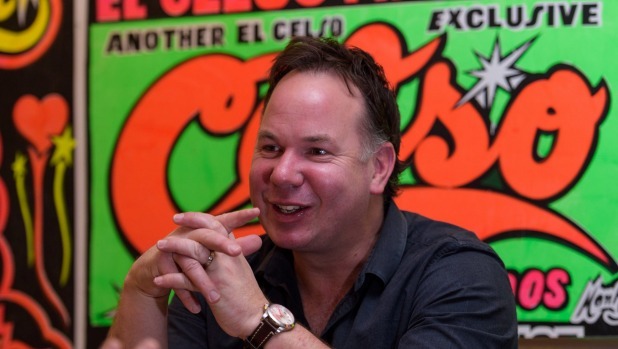 When Andy was in his early teens, the family moved to Melbourne. It was a traumatic shift. "I'd only been to the city a couple of times, to see the shop windows at Myer, so when Mum said we were moving here I thought we were moving into those windows," he says. "My hair started falling out in clumps due to the stress. Mum asked what's wrong, and eventually I said, 'I can't go there'. She said, 'Where do you think we're going?' And I said, 'Those windows, with everyone looking at us'." Is there a clue in that story to help explain why the Sand Hill Road boys have a second string to their bow, as filmmakers? The company produced Melanie Hogan's 2006 documentary Kanyini, about Indigenous philosopher Bob Randall, and the 2010 short film Minnie Loves Junior (Andy and Matt wrote and directed, Tom and Doug wrote and produced), about a budding love between two Indigenous kids in Port Augusta. The short played at more than 70 international festivals (including Berlin) and won a number of prizes, including a $10,000 cash award that the partners used to build a BMX track in the town where it was shot. Just like with running pubs, none of them had any experience in filmmaking until they did it. The interest remains, though the time to pursue it doesn't. "We'd like to make a feature one day," says Mullins. "But it's probably a couple of years away." At any rate, he knows all eyes will be on the group's next move. 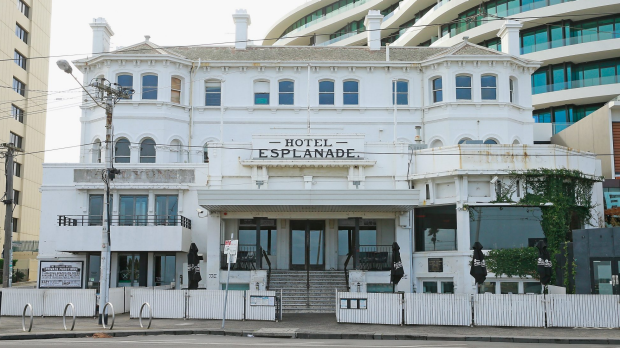 They've taken on perhaps the most iconic pub building in Melbourne, the Esplanade Hotel in St Kilda. They bought the building outright from previous owners Vince Sofo and Paul Adamo, who had owned it since 2006, in May last year. It is the pub of their dreams, says Mullins, but they know it's the pub of everyone else's dreams too. "The day we signed, Vince said, 'As much as you've bought the Espy, you'll never own it. It belongs to Melbourne'." As soon as word got out, the calls started coming in, "from ex band bookers, patrons, musicians, the historical society, locals". Taking it on is "a serious legacy", Mullins says, but after two years in mothballs, "everyone just wants to see it open again". Buying the Espy has wrought a few changes in the way Sand Hill Road does business. They've taken on a fifth partner, long-time financier Andrew Lark. They've also had to go to the bank for the first time, borrowing the money (rumoured to be about the same as they've spent on Garden State) for the refurbishment that will open up parts of the building few even knew existed. "No one alive today who didn't work at the Espy would have seen the levels above the grand staircase," he says, and few would realise it's actually a five-level hotel. "There's a basement, sub-basement, the ground floor, which is what most people are familiar with, and two levels above it. It's going to be pretty exciting to open it up again." 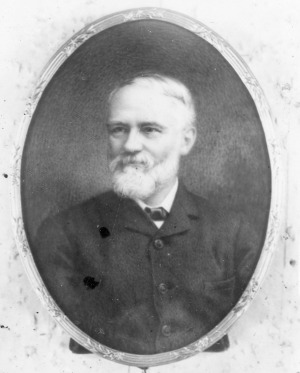 Researching the hotel's history has given Mullins and his partners an insight into one of the most influential "confirmed bachelors" in the history of Melbourne, Alfred Felton, the man whose bequest helped fund many of the National Gallery of Victoria's grandest purchases. "He lived at the Espy, he died at the Espy, he had two rooms – a reception room and his bedroom – at the Espy. They were stuffed full of documents, maps, artefacts and art, whiskey and wine." When it finally re-opens, probably around November, the top level will be turned into a cocktail bar called The Ghost of Alfred Felton, lightly renovated to create the impression he's only just stepped out. There will be three live music stages too – in the front bar, as of old, in the Gershwin Room (where the long-running TV show RocKwiz is filmed, this is the one part of the building that's largely functional at the moment), and in the basement. "We'll try and pay respects to the full history of the place," he says. After all, it's what the community wants.